This review first appeared in the July 5, 2007 issue of the North County Times. Escondido's Soundescape takes the basic power-trio model of rock that Jeff Beck pioneered 40 years ago and updates it for today's ears. Informed and influenced by everything from classic rock to punk, alt and hard-core to metal, Soundescape mixes equal parts enthusiasm and skill with a generous dash of creativity to arrive at a sound that straddles hard-core and mainstream. If the overall sound is alt and punk, the prominent role of the guitar playing of Christian Williams (who doubles as the band's singer) hearkens back to the '60s, '70s and '80s. There's a focus on his guitar solos and melodic leads that recalls the guitar hero age of rock. Drummer Jason Thompson provides a beat both rock steady and impressive in its creativity. No mere metronome, Thompson and bassist Rowdy Bossard combine to create a solid yet colorful foundation for Williams to sing and play atop. Good songwriting fills out the 10 tracks here, but that one killer song is all that is missing. 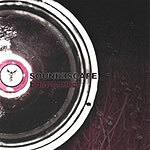 Find that, and Soundescape is ready for the big time.